Clear excess Heat, calm the patient. Tonifies Qi, nourishes blood, invigorates blood, dispels wind, settles the liver and extinguishes wind, nourishes yin, opens orifices. 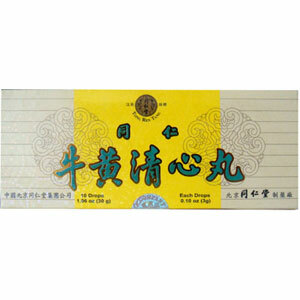 Beijing Ching Shin Natural Herb Drops has been popular since the Ming and Ching Dynasty in China. It is made according to an ancient palace formula. It contains over 10 precious natural herbs wrapped with pure goldfoil for freshness. Do not take if you are pregnant or nursing. Do not take if there is still bleeding in hemorrhage cases. Avoid greasy foods.